The 2015 Shad Derby Festival Chairs Kristin Hoffman & Neill Sachdev proudly announce the Schedule of Events for the upcoming 2015 Windsor Shad Derby Festival on Saturday May 16th, 2015 from 9am-4pm in Windsor Center. The jam packed day of activities for "Windsor's Most Beloved Festival" is filled with entertainment, artists, magicians, special appearance by "Pat", the official mascot of The Patriots. and fun surprises for all to enjoy on May 16th, 2015!! Festive Plastic Derby Hat Give Away to the first 1,000 people on the Town Green to kick off the 50th Shad Derby Festival on the Green & Parade !!! Prizes awarded to participants who hit the Derby target !!! All ages welcome !!! New for 2015 - The first kid to get 5 apples out of the Ace Hardware bucket wins a local Gift Card !!! 3rd annual Shad Cooking Demo from Windsor's own Chef Renee !!! For ages 21 and older - enjoy the afternoon in Windsor's famous Shad Derby beer garden seeing old friends and new ones while listening to local music from Gene Donaldson & surprise guests while enjoying the best beer selections from Hartford Distributors including the very popular Shad Derby Pale Ale from Back East Brewery!!! Enjoy "Windsor Most Beloved Parade" with friends, family and neighbors as the Parade Kicks Off from Windsor High School and makes its way down Capen St. towards Windsor Center featuring various local groups, marching bands, surprise guest appearances and the 2015 Shad Derby Queen Eleanor Moore and her Court along with the rest of the 2015 Shad Derby Queen Candidates. So grab your seat along the Parade route and enjoy the Shad Derby Parade friends, family and neighbors!!! Special Appearance by "Pat", the official mascot of The Patriots. The 3rd annual Shad Derby Pie Eating Contest is fun for all ages !!! The first to finish their pie wins a gift card to Windsor Center's popular Get Baked Bakery !!!! Enjoy watching Windsor's Villari's Martial Arts students as they show off their skills on Derby Day !!! The 2nd annual Shad Derby Mac N' Cheese Eating Contest from New England's famous Bear's Smokehouse BBQ starts at 2pm. The participant to eat the most Mac N' Cheese in 5 minutes will win a $100 Gift Card to Bear's Smokehouse BBQ !!! The 3rd annual Wild Wings Eating Contest takes place at 3:00pm and another round is set for 3:30pm this year. The first participant to eat 12 boneless "Wild Wings" wins a $50 Gift Card to Buffalo Wild Wings!!! 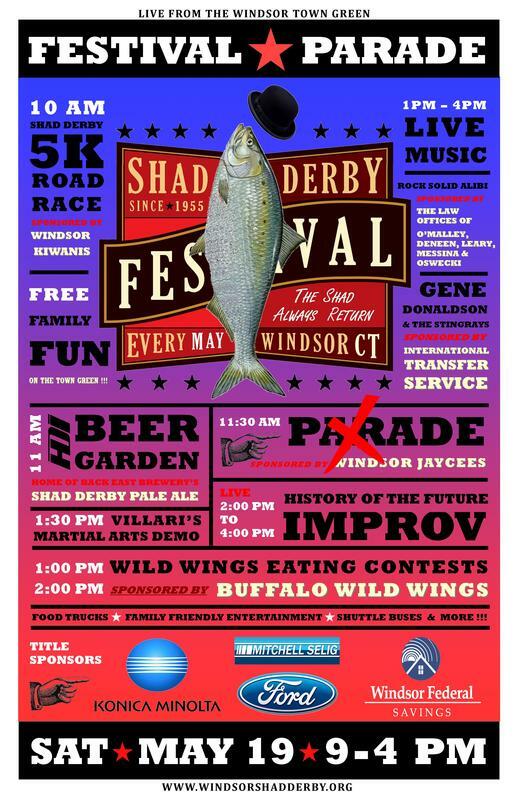 In addition to all the great events - appearing on the Windsor Town Green Shad Derby Day this year will be the Windsor Historical Society hosting a "Shad Derby Selfie Station" and "Shad Derby Story Station" collecting residents and visitors favorite Windsor Shad Derby Festival memories and stories from the past 50 years. The Windsor Food Bank will also be on the Town Green collecting donations and much needed supplies to stock up our local Windsor Food Bank for residents in need. Both Windsor booths are a must to stop and visit this year in addition to all the other great organizations and businesses on the Green Shad Derby Day !!!! Limited Parking in Windsor Center. No dogs or bikes allowed on the Windsor Town Green Shad Derby Day. Residents and spectators are strongly encouraged to take the Shad Derby shuttle buses to Windsor Center from Windsor High School. e Windsor Shad Derby Committee is proud to announce the selection of Eleanor Moore as the 2015 Windsor Shad Derby Queen. Moore was chosen to reign over "Windsor's Most Beloved Festival" as Shad Derby Queen along with the Queen's Court at the recent 50th Shad Derby Coronation Ball in Windsor. Moore, a Windsor High School senior, is planning to attend Ohio University Scripps College of Communications for Photojournalism. Moore has lettered four years in girls' varsity swimming and diving, serving as team captain the last few years. She was a state finalist in 200 Medley Relay and 100 Breaststroke and recipient of Windsor High School Tomahawk Award in recognition of four years All-Academic Team. Moore is an Honor Roll student and CAPT scholar. She has been a featured artist in Windsor Historical Society exhibitions and is the president of the Windsor High School Feminist Coalition. She has also managed to be a Kids and Critters Club mentor, junior counselor for Northwest Park Camp, an Alex's Lemonade Stand volunteer, senior citizen aid, and manager of Windsor High School boys' swimming and diving. While celebrating the long-standing history of 50 years of the Coronation Ball as part of the Windsor Shad Derby Festival, the selection of Eleanor Moore made some Windsor Shad Derby history as well, as she joins her sister Kaelyn (2011 Shad Derby Queen) with the unique distinction of being the only sisters to have ever been selected Windsor Shad Derby Queen in the 50-year history of the festival. The 2015 Shad Derby Queen's Court was also chosen from the field of 16 very deserving young ladies from Windsor. The Queen's Court includes: Michelle Nguyen, 1st Princess; Victoria Huertas, Princess Royal; Analiese Eleveld, 2nd Princess; Emily Kopacz, Miss Congeniality; and Lauren Canoni, who took home the Mary Ellin Messina Award as well as the newly-introduced Vincent Scully Memorial Award. The community service memorial award was recently named and presented in honor of the late Vincent Scully, past festival chair and longtime sponsor and supporter of Windsor Shad Derby Queen candidates. To see newly-crowned 2015 Shad Derby Queen Eleanor Moore, the 2015 Queen's Court and all the great Shad Derby Queen's candidates reign over the 50th Windsor Shad Derby Festival and ride down Windsor Center in the beloved Shad Derby Day Parade, please come out to the Windsor Town Green on Saturday, May 16, from 9 a.m. to 4 p.m. For more information, visit http://www.windsorshaderby.org. 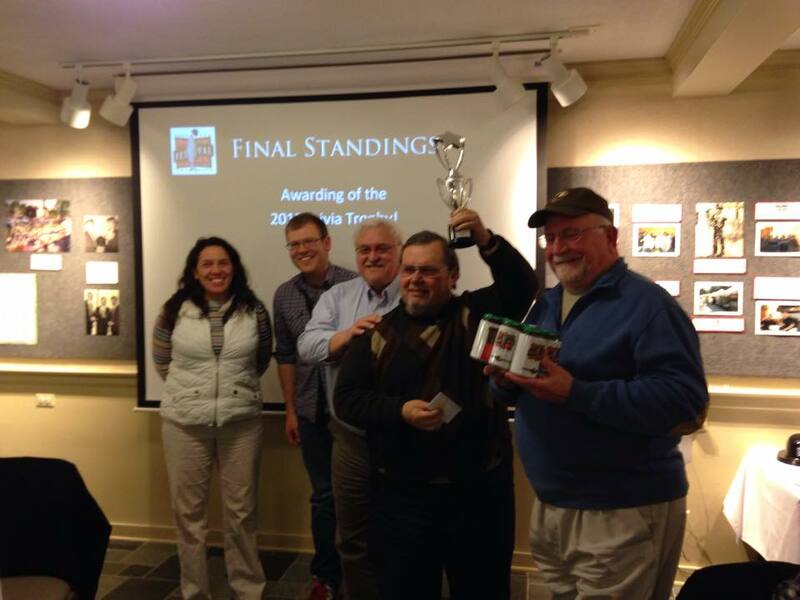 On April 9th, 2015, the 3rd Annual Shad Derby Trivia Contest was held at the Windsor Historical Society. Teams of up to 6 members competed during five rounds of questions ranging from general knowledge to Windsor-specific facts. The Windsor Lion's Club was the team with the most points. They received bragging rights for a year, gift certificates and a trophy. Congratulations! Back East Brewery will again be brewing its Shad Derby Pale Ale to honor the Windsor Shad Derby Festival, a festival held annually in Windsor, CT on the third weekend of May. Coming off an enormously popular response during its first year when it was only available on draft, Back East will now also be offering the beer in six-packs of 12 ounce cans. The limited beer will be available in cans at Back East Brewery and area package stores, on draft at participating bars & restaurants, and in the beer garden at this year's Shad Derby Festival on May 16, 2015. Shad Derby Pale Ale is an American Pale Ale brewed with 100% Centennial hops. Back East Brewery co-founder and Windsor resident Tony Karlowicz cites the Festival's importance to this area and Back East’s affiliation with it. "The Festival has a meaningful and long standing history in the area and we’re proud to be a part of it. Coming off a major expansion, we’ll be brewing much more of this beer this year and we’re excited to now have it in cans for the first time. It's the perfect match when you think of Back East and coming back home, as the Festival always takes place every May in Windsor". Windsor Shad Fest Bureau President John Jary agrees with Karlowicz adding that "everyone involved with Windsor's Most Beloved Festival is excited to have Back East Brewery brew this signature beer again as it truly highlights the best in the area and we especially look forward to seeing the Shad Derby Pale Ale in those amazing looking cans!" Jary also noted "It's quite an honor from Back East and very fitting this year as the Windsor Shad Derby Festival celebrates it's 50th anniversary !" This Shad Derby Pale Ale will be available on draft and in cans at Connecticut restaurants and package stores for patrons 21 years of age and older beginning the week of April 6th, and at Back East Brewery beginning Thursday, April 9. Karlowicz also notes that a portion of the proceeds will benefit "Windsor's Most Beloved Festival". For those patrons 21 years of age and older who want more information and availability about Back East Brewery's Shad Derby Pale Ale go to http://www.backeastbrewing.com/ . The contributors of the news feed are volunteers from the Windsor Shad Derby organization.